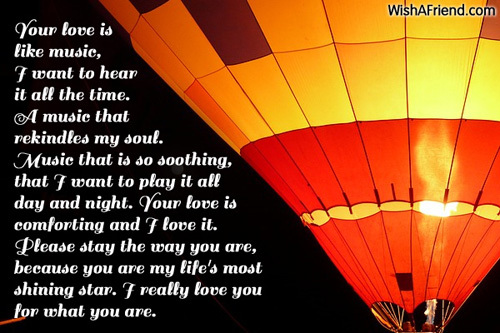 Find and share romantic love letters with your beloved. You can share/send them to your loved ones via Text/SMS, Email, Facebook, Whatsapp, IM or other social networking sites. Love has no reason or time. When you love someone, it just happens. As it happened with me! When I am with you, I really don't know what I am going through. So many emotions unsaid, so many things old and new. It's just your gestures and words that resonate in my life. I am glad that we met and I am glad to call you mine. I love you! Hey Honey, Sometimes I sit back and count my blessings. Each time I do, you are the first person who pops into my head before all the wonderful things I am blessed with. And why wouldn't you? When I recollect how my life used to be before you entered it feels like a horror in comparison to the paradise you have shown me. You are like this Ray of hope that keeps me going no matter how tough life gets. Do you know what's the best part? It is knowing that even if all fails I'll always have you. 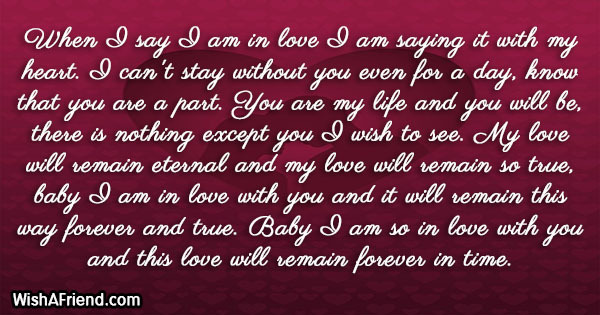 I love you, Your Lover, now and forever! When I say I am in love I am saying it with my heart. I can't stay without you even for a day, know that you are a part. You are my life and you will be, there is nothing except you I wish to see. My love will remain eternal and my love will remain so true, baby I am in love with you and it will remain this way forever and true. Baby I am so in love with you and this love will remain forever in time. A special feeling called love that I celebrate with you. Your eyes speak to me a thousand words; your ways just let me be myself. I get lost in your gestures every time, I want to be yours forever with a smile. I can't thank you enough for making my life so colorful and so wonderful. Baby you make me complete and you make my life complete. Thanks for everything and thanks for your true love. I would be nothing without your love. Baby I am in love with you. I love you so much pretty. There is not a single moment in life when I don't think about you. Not a single moment when I don't feel you. 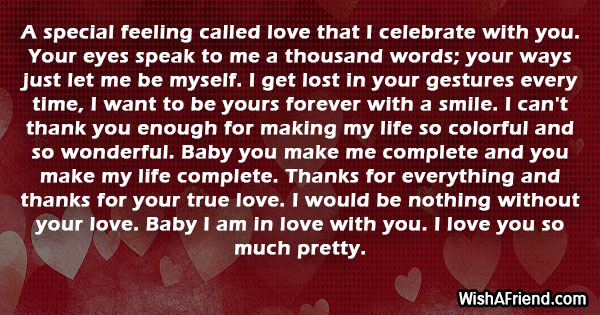 I think I truly love you and that is only true. 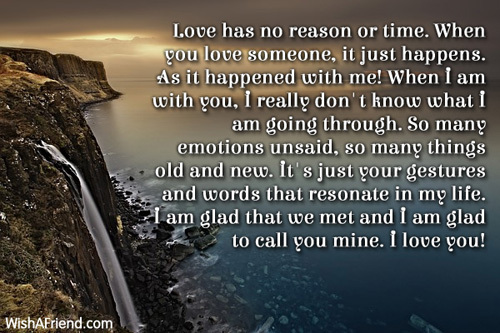 Love as a reason is enough for me. I love you for what you are. I love you for who you are. Does not really matter to me, but I love you to thee. Your love is like music, I want to hear it all the time. A music that rekindles my soul. Music that is so soothing, that I want to play it all day and night. Your love is comforting and I love it. Please stay the way you are, because you are my life's most shining star. I really love you for what you are. Some things are just so beautiful in life, like the love that I can see in your eyes. Love is a wonderful feeling and I have realized being with you. I can see the passion in your eyes; I can feel the love being with you. Baby just the way you are and just the way you care, I will always be there for you in life. Baby I love you so much in vice. You are and will remain special is all I want to tell you. I am so in love with you. You truly mesmerize me when you look at me. There is no one except you to see. Your love gives me a power to say. It helps me give me strength on my way. Your love completes me and makes me a better person each day. You have a say in my life, you have a say in my being. Baby do not change the way you are for I love you the way you are. Your love gives me so much that I cannot just stay without your touch. Your love is the power that I feel. I love you so much baby. Hey there, What do I love the most about you? Your smile that reaches your eyes and shows your honesty. Your lips that speaks words that are only for the good of others. Your mind that is a crazy blend of brilliance, maturity and consideration. Your hands that are ever willing to reach out to me whenever I need you. Your feet that I know will walk with me forever. But what I love the most about you is your heart, because I have always believed it to be my home. Always want to be your baby, I am yours! 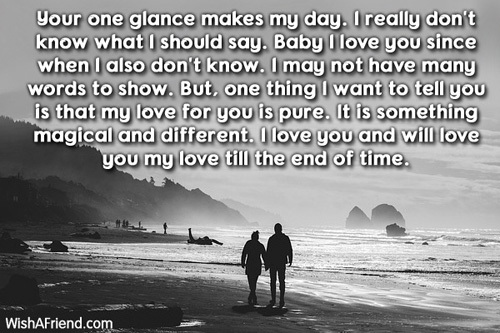 Your one glance makes my day. I really don't know what I should say. Baby I love you since when I also don't know. I may not have many words to show. But, one thing I want to tell you is that my love for you is pure. It is something magical and different. I love you and will love you my love till the end of time. Love starts with one sight; it's then about sweet nothings. 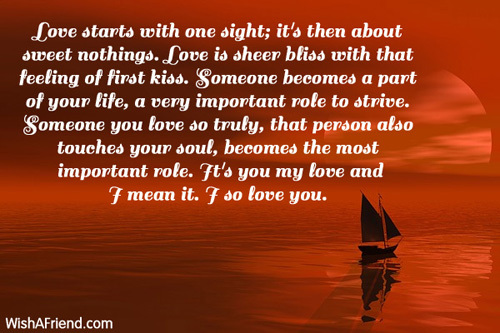 Love is sheer bliss with that feeling of first kiss. Someone becomes a part of your life, a very important role to strive. Someone you love so truly, that person also touches your soul, becomes the most important role. It's you my love and I mean it. I so love you. I just want to thank you for coming in my life. You are like the ray of light that brightens up my whole day. Your lovely smile has a cool effect on me. Your expressive eyes tell me a lot that I need to see. Baby! 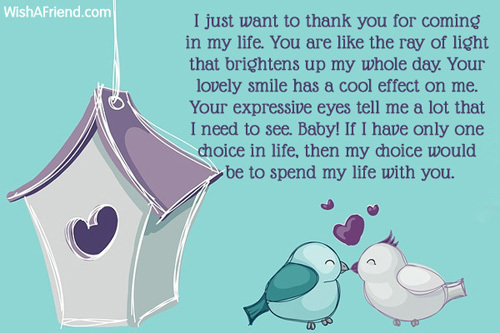 If I have only one choice in life, then my choice would be to spend my life with you. You know what you are the most charming and wonderful person I know. I am so lucky as I have found my true love. Your love has a magical effect on me, its every time that I see you, I feel so in bliss. Please stay this way forever in time. Baby, I want to seal our love with a loving kiss. You mean the world to me. You are my ecstasy. I love you. There are differences in me and you. But, when the love is true, nothing else matters in life. You are my key and I am your lock. You unlock my heart with your affection and love. Baby, I just want you to know that there is not a single moment in my life when I don't really miss you or I don't think about you. 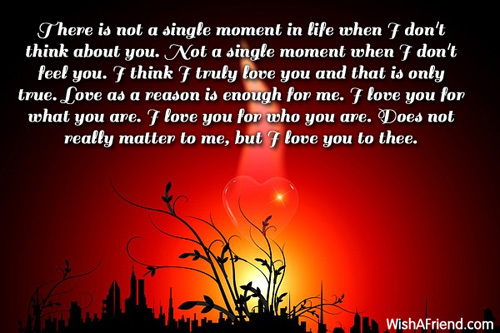 Yes it is true...that I so love you. You are the love of my life and you will remain. I never expressed my love for you and I know it is late. 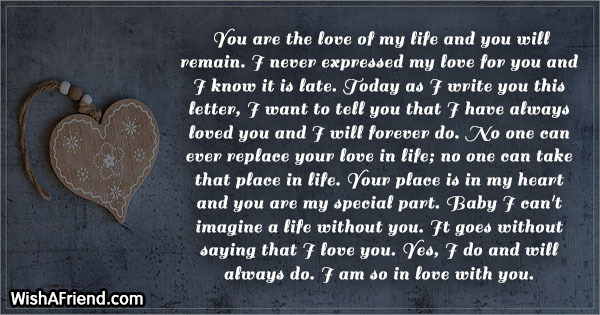 Today as I write you this letter, I want to tell you that I have always loved you and I will forever do. No one can ever replace your love in life; no one can take that place in life. Your place is in my heart and you are my special part. Baby I can't imagine a life without you. It goes without saying that I love you. Yes, I do and will always do. I am so in love with you. Aww! When someone takes your name you know I start blushing. Why I blush, you also know I don't have reasons to show. But one thing is in my mind, that you mean the world to me you are one of a kind. 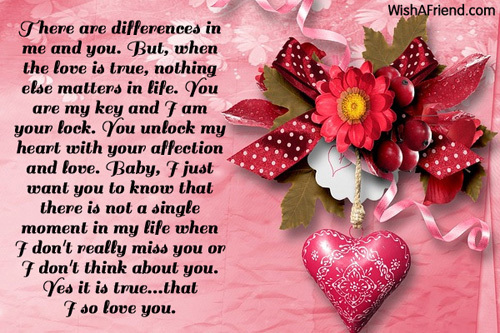 Special in every way and special you make me feel each day. I love you. My heart yearns for your love. My body for your gentle touch. The more I see you, the more I think about you. Your lovely smile makes my day. When you speak to me, I lose my say. I think I have fallen really hard for you. Baby! I would like you to know that I truly love you. It's not a single moment or day that I don't really think about you. Love you!